OSHA’s Press Release and the conflicting responses from the State Plans caused significant confusion for employers. As we discussed in an earlier article, establishments in states that had not adopted an E-Recordkeeping Rule were not legally required to submit data, and there was no legal risk for declining to do so. 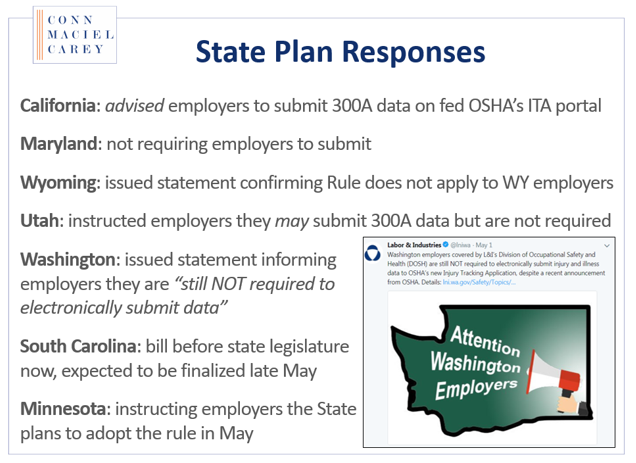 Although establishments in State Plan States that had not adopted the Rule got another pass on submitting 300A data, fed OSHA’s April 30th Press Release did garner attention from State Plan administrators, and many of the still-delinquent states quickly moved to adopt an E-Recordkeeping Rule, including Minnesota, South Carolina, and Utah. The State of Maryland has not yet adopted OSHA’s new electronic reporting requirements found in 29 CFR, Part 1904 of the OSHA Recordkeeping Regulation. 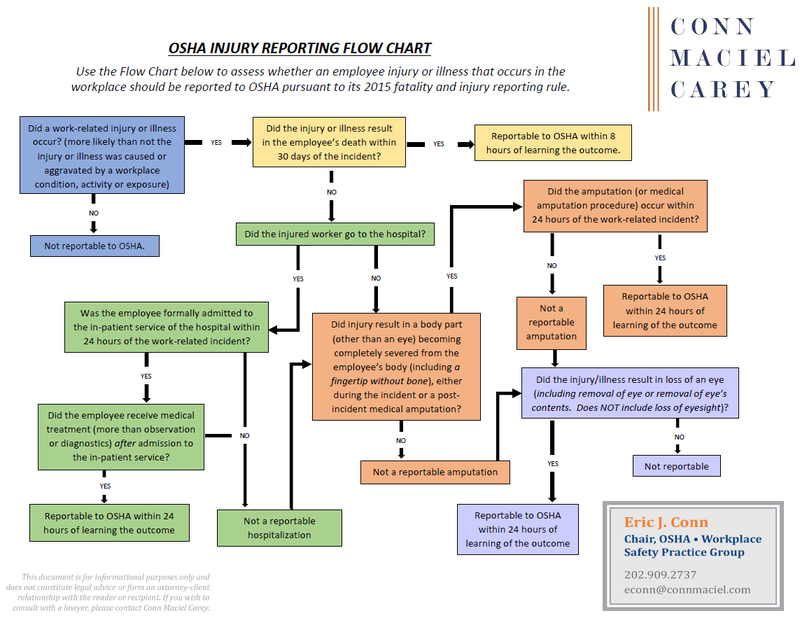 As such, Maryland employers are under no legal obligation to register and/or submit their OSHA 300 information to OSHA via OSHA’s Injury Tracking Application (ITA). Additionally, the Maryland Occupational Safety and Health Agency is not accepting OSHA 300 log data at this time. However, WY OSHA has taken steps to formally adopt the Rule. WY OSHA filed a proposed rule with the Secretary of State’s office on April 20, 2018 and accepted public comments through June 4, 2018. The WY OSHA Commission is expected to vote on adopting the Rule soon. California has taken a different approach from those State Plans that formally adopted the Rule as-is and those that still have not. On September 19, 2018, California Governor Jerry Brown signed California Assembly Bill 2334 (“AB 2334”) to make various workplace safety and health changes to California law, which is largely in response to fed OSHA’s recent proposal to eliminate the requirement for large employers to submit 300 Log and 301 Incident Report level data. AB 2334 appears to be taking steps to impose its own version of fed OSHA’s E-Recordkeeping Rule, including signaling a desire to maintain the requirement for large employees to submit 300 and 301 data. The California Bill requires Cal/OSHA to “monitor” rulemaking at the federal level and, if Cal/OSHA determines that fed OSHA has “eliminated or substantially diminished” the electronic recordkeeping rule, the California agency is required to convene an advisory committee within 120 days to “evaluate how to implement the changes necessary to protect the goals” of the proposed federal rule as issued in May 2016 under the Obama Administration. This is a major shift back to the Obama Administration’s midnight “Volks Rule,” where fed OSHA adopted a five-year statute of limitations for recordkeeping violations during the final days of the Obama Administration. The rule was repealed quickly by the Trump Administration when the Republican Congress and new President Trump signed a resolution to revoke the rule under the Congressional Review Act. Therefore, California employers need to follow these new recordkeeping obligations and the potential additional requirements that may be in store if Cal/OSHA decides to go further.